Sakai Guides and DocumentationSakai Complete User Guide PostEmHow do instructors view feedback in PostEm? To view all participants' feedback. Zoom: Instructor view of feedback items list with view link highlighted. In the row of the feedback item you want to view, click the view link. Zoom: Feedback display with the first row of column heading and a row for each student. Usernames of student who have not checked feedback highlighted in bold and red color. This displays feedback for all students. 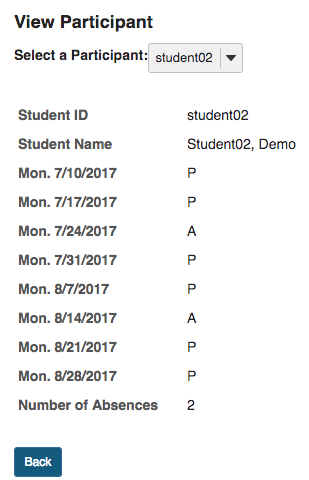 In the Username column, those students who have not checked their feedback are shown in bold and red. The Last Checked column shows when (if ever) the student last checked their feedback. To view an individual participant's feedback. Zoom: Instructor view of feedback items list with view participant link highlighted. In the row of the feedback item you want to view, click the view participant link. 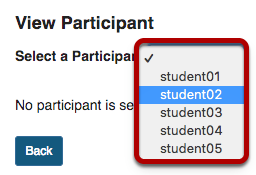 Select the student's username from the drop-down menu next to Select a Participant. This displays the individual student's feedback for the PostEm item. Prev: How do students view their feedback in PostEm? Next: How do I download a copy of the CSV feedback file?